TPLF crowded all civic, judiciary, police, parliament, the election board, almost all managers of public organisations, and all fabricated political organisations with its own party members. It goes further than that; you have to be a TPLF member to get a job. The question is what are the available means of replacing TPLF with democratic system in the country? We Ethiopians do not lack political parties, we have numerous in the country and in the diaspora, what are the strategies selected by these parties and what is the chance of success by any one of them? a. There is a high level of suspicions of many Ethiopians on the Eritrean government honesty and commitment to support this struggle, as shown by the experience of EPPF. c. Many documented studies indicate that governments that come through armed struggle tend to be dictatorial, even if any of the group is going to be successful; there is no guaranty that the government that will be formed will be democratic. d. Ethiopia has seen the results of long drawn armed struggles. 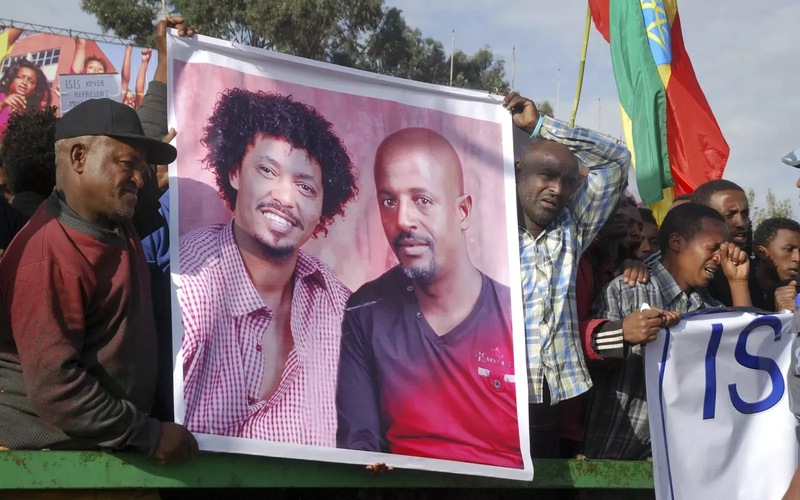 The cost to the nation in human life sacrifices and resource will be immense; on both sides, Ethiopians are fighting Ethiopians, killing each other’s. a. The inherent dictatorial and ethnic nature of TPLF have created a condition that Ethiopia may not survive as a nation. The more pressure applied on TPLF internally and externally, the more it becomes more unpredictable and erratic. If there arises a possibility of losing power, nothing stops TPLF to implement article 39, there is an urgency on the ground. This is a struggle for the survival of the nation: if we do not fight to save the country now, once it is broken into small banana republics, there is nothing to fight for; we will be truly without a nation-hood. b. The characteristics of the government becomes more bizarre, as indicated by the recent election, after announcing 442 seats of the parliament, the other constitutes will take more than a month to declare. I guess TPLF is calculating what to give to opposition members, after excluding all influential leaders of the parties. This rather gives impetus for parties and individuals to examine their strategy and some may be pushed to choose armed struggle. In addition, this provides those groups that choose armed struggle, to continue with their strategy as the only means to dislodge TPLF. c. The incursion of Ethiopian military in late May 2015 into Kenyan territories (although this is denied by the TPLF government), and the decision by the TPLF to deny Ethiopian air space to Kenyan President, Uhuru Kenyatta’s, airplane shows clear indication of the erratic behaviour of TPLF. Kenya has now decided not to go with the agreement to import 440MW of Electricity from Ethiopia. Depending on the level of this conflict and future escalation, the parties that engaged in the armed struggle may find another host to pursue their goal. These parties are based in the West, and generally there political program are aimed to be part of the transitional government once TPLF is out of the picture. However, there contribution to remove the TPLF government is minimal and limited. There is a sense of lack of direction and vision that can spell out to mobilise Ethiopians’, it is time to come together and organise under one umbrella organisation to remove TPLF, and revisit their strategy effectiveness to remove TPLF. These parties are all based in Ethiopia and registered with the National Election Board of Ethiopia, (not including the one fabricated by TPLF), truly sacrificed a great deal in the struggle to change the system using the ballot box. TPLF has clearly demonstrated that it is not interested in democracy; the election was a window dressing to get more aid money from the west. The change of strategy is an essential key requirement for these parties to be significant, election will not work. A change of course required for the struggle, there are some suggestions below to take the struggle forward and to be effective to dislodge TPLF. This is a growing and upcoming possibility (Suggested by Professor Tecola Hagos and Professor Messay Kebede), see the article by Professor Messay Kebede: http://www.durame.com/2015/05/is-tplf-unintentionally-preparing.html. The results of a military takeover complicate the situation further, we Ethiopians’ suffered and still suffering deeply because of the previous military government, if this happens again, it is difficult to see a way out to form a democratic system. The Ethiopian army is not a unified force for the following reasons: the army generals have free hand to appoint whomever they choose, in an ethnically based system, individuals tend to choose their friends and families that they grow up together, where they can firmly put their trust on this groups of individuals. This further leads to more fragmentation, each division in the army reflect each area in the Tigray region, more like the era of Mesafent, but only in Tigray. Rene Lefort, noted that the army become a state within the stat. Its military and economy power creates a struggle among these groups for the control of this multimillion industry. If not checked, the conflict can escalate further creating hostility and division that can lead to a distractive and costly war within the army. The role of intellectuals in identifying treats and suggesting possible remedy contributes greatly to the struggle to democratise the country, everything starts from an idea. Intellectuals engagement is critical in the continuation of Ethiopian survival in the future in critical. It seems that we have very few intellectuals who speak out, about not only the injustice, killings, and lack of freedom imprisonment of innocent citizen, but also what can be done NOW to avert disaster in the future. The conference organised by ESAT was a good start to discuss possible solutions and strategies for removing TPLF and formation of a democratic country. The ideas presented at the conference including the way forward, and the possible scenarios for the future democratic government were presented, this need to continue to formulate a sensible idea at each juncture of the struggle to formulate a democratic country. The presidential system suggested by Dr Birhanu Negga affirms Ethiopiawinet, it is a sensible suggestion, need to be discussed further if there are any other ideas. I suggest that ESAT makes this a regular conference that should include a wide range of participants who hold opposing opinions. If we want to have a country that we can call home, we have to work a lot harder than this, all of us. I would like to thank ESAT for organising the conference; one point which I would like to add is this, ESAT has done a great contribution to the struggle for freedom and democracy than many of our political parties. Our civic societies have also a role to play in participating all their members and affiliates to create a condition that will be difficult for the government to continue. Those of us who resides in the West need to start voicing our concern, in organised manner to lobby our parliamentarian wherever we live. We have to focus our energy and work together to form a truly inclusive and democratic country. If we want to be effective, we have to include the Ethiopian people in the struggle. The struggle should be organised at the grass root level, organising, generating awareness of the situation, and being creative in the struggle. This strategy has already started in Ethiopia; we require anyone and everyone, even on individual basis to convince the people to make it impossible for the government to continue in this form. The Muslim community has started by holding coins to make the country ungovernable for the dictatorial government. I urge parties that are so far, become insignificant need to work together under a single umbrella organisation to organise the grass root to dislodge TPLF and form a truly democratic country we all crave.